Like all Bugaboo strollers, the Bugaboo Buffalo is known for its high quality, smart design, innovative functionalities, smooth ride and its ease of use. Designed specifically for all-terrain performance, the Bugaboo Buffalo is a must for parents who love to discover. The Bugaboo Buffalo offers all the functionality you need, and more. Have a look at the optimized foam filled tires which let you discover any terrain, the rotating carry handle for those scooping-up-kid moments, the one-piece-fold self standing chassis that makes it easy to store the stroller or take it with you wherever you go, or the included rain cover that protects your child from head to toe. You can of course also try out one of the accessories to further customize the Bugaboo Buffalo. This all-new, all-terrain stroller is suitable from infant to toddler with both the bassinet as well as the seat able to be used separately from the chassis. What’s more, the modularity of the Bugaboo Buffalo allows you to take with you only what you need. So no need to pack to the max for those outdoor weekend trips! 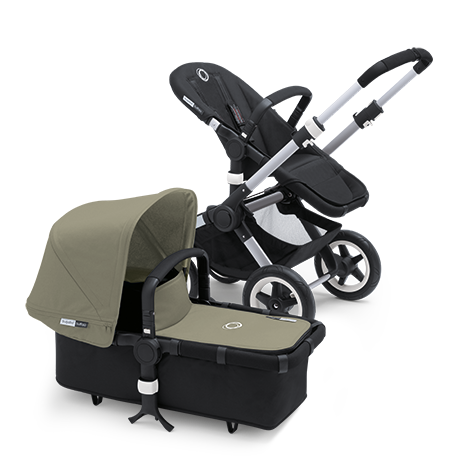 The Bugaboo Buffalo is strong and durable enough to travel all terrains and carry an 86 lb load. It not only allows a seat load of up to 50 lbs, but also carries 35 lbs of luggage for you. In fact, the Bugaboo Buffalo is the first stroller worldwide to offer the possibility to hang a bag of up to 13 lbs on the handlebar as certified by renowned international test houses. In short, the Bugaboo Buffalo is truly a robust stroller. The Bugaboo Buffalo has a large accessible underseat bag to store whatever you need. But that’s not the only thing that makes this stroller spacious. The high positioned seat and bassinet make it more convenient for you to lift your child in and out of the stroller and thanks to its smart geometry, the Bugaboo Buffalo makes walking behind the stroller more comfortable, allowing more space for taller parents.